Over spring break, I was privileged enough to experience the sights, sounds, and culture of the beautiful country of Spain. Traveling around the country by car, I was able to take in the many different aspects of the country. Everything from the ornate architecture and unique food to the very culture of the country itself made for an extremely rewarding trip. The most interesting features of the Spanish architecture was its sheer age. An old building in the US might be two or three hundred years old, whereas in Spain the average building could easily be over 1000 years old. The colorful buildings, skinny cobblestone streets and the beautiful cathedrals and monuments were unlike anything I had ever seen from back at home before. The thing that impressed me the most was the extreme detail put into every little part of the huge structures around the country. From the murals and images delicately carved and etched into the roofs of the rotundas of cathedrals to the images on the streets made completely out of cobblestone, the miniscule singularity and detail put into every edifice around the country amazed me. 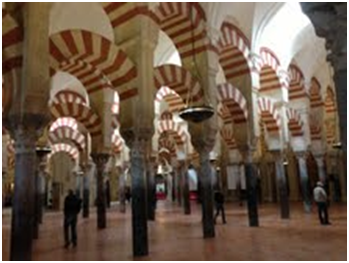 One of the most beautiful displays of architecture I saw was in the Cathedral of Cordoba, an inveterate Cathedral which was a mosque when occupied by the Muslim Moors. A strong Muslim influence in the architecture of the Cathedral can be seen with its elaborate pillars and its massive size. Another interesting aspect of the Spanish architecture was the country’s infrastructure. Many simple yet beautiful skinny one way streets that weaved throughout the many shops and apartments were a typical part of nearly every city in Spain. It was easy to get lost in the maze of streets that snaked throughout different cities. The Spanish cuisine had a strong Mediterranean influence in nearly everything you ate. No, it wasn’t like eating at a Mexican restaurant. Yes, Spain and Mexico are two different countries. Surprising, I know. Breakfast usually consisted of some sort of pastry or bread item and a fruit. Being from the good ol’ US of A, I always eat the traditional big breakfast of eggs, bacon, pancakes, etc., so I was just about dead halfway through the day having to sustain myself on some mere bread and fruit until lunch. Probably explains why everyone is so skinny in Spain. Throughout every eatery in Spain, the menus consisted of very European and Mediterranean style dishes. Everything from tomatoes to olives to a unique ‘Iberian Ham’ worked their way into almost every dish you ate. One of the oddest dishes I ate was in the town of Cordoba, one of the oldest towns in Spain, and famous for its bullfighting. The dish was none other than ‘Rabo de Toro’, or bull’s tail, served up in a sort of stew. It certainly made for quite the unique eating experience. In the Spanish culture, the drink you have with every meal is more often an alcoholic beverage than water. The Spanish ‘Sangria’ was popular amongst the locals, but the sweet Spanish ‘vino’ (wine) and ‘cerveza’ (beer) were also standard. Whenever you would order water, they would never bring you it in a glass as they do in America, but rather in ornate glass bottles. One of the most unique drinks I must have had was their hot chocolate. 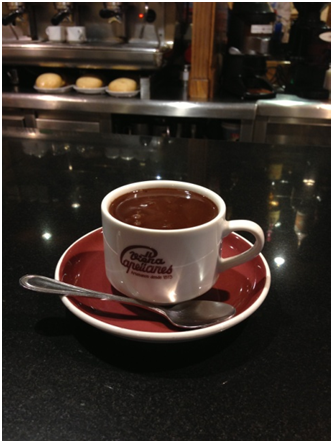 Unlike the typical American hot chocolate, the Spanish ‘Chocolate Caliente’ was more or less liquefied chocolate in a cup with a bit of cream. Delicioso! The most astounding aspect of the anomalous culture of the country was its people. The hospitality of nearly everyone you met left me with a very positive image of the country and its people as a whole. It appeared that everyone in the community of different cities were very close and devoted to maintaining relationships with each other. Nearly everyone you passed walking in the city would always be with friends, family, or their partners, conversing and enjoying themselves and in no rush at all, something that seems to be all too absent in the United States. The Spanish obsession with the game of soccer was just as you would expect it. Everywhere you went you saw someone wearing a “Lionel Messi” or “Cristiano Ronaldo” jersey, renowned as the soccer gods of Spain. I was lucky enough to get to experience this unique aspect of their culture firsthand by attending a soccer game of “Atletico Madrid”. 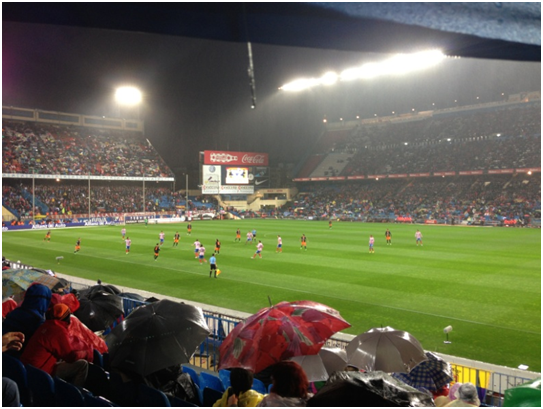 Although the game resulted in a 1-1 tie, it was incredible to see, even in the pouring rain, the passion that the people of Spain have behind their soccer teams. All in all, the trip served as an amazing opportunity to experience firsthand the culture and people of an incredible and beautiful country.